One of the reasons we were keen to visit Bratislava (on top of the fact that it is an amazingly beautiful city and we love Eastern Europe) is that it is so close to Vienna. In fact they lie only 34 miles from each other, some have even stated them to be the closest capital cities in the world, but that is in fact false (The closest capital cities of two sovereign countries are Vatican City, Vatican, and Rome, Italy) but who cares… they are mightily close in any case! Bratislava is a wonderfully charming city, but a trip to Vienna is always a must! So, you are in Bratislava and you want to head over the border into Austria and see the outstanding beauty of Vienna… good choice! Getting from one city to another is really quite easy and unlike in many other places where people generally look at you like you have grown a second head when you want to take public transport from one country to another (I’m looking at you Krakow to Lviv) Bratislava is pretty well geared up for those wanting to make this journey. You will find help and information easy to come by as well as many, many options for making this trip. The “Novy Most” or UFO Bridge is a socialist icon of Bratislava… and the city’s main bus station is located underneath it on the old town side of the river, the harbour is also a short walk from here. The two main options available are by bus or by river, the later including either ferry or hydrofoil. Both have their plus and negative points but crucially for us the river services only run during the main season, which is April to October, so do bear that in mind! The price can fluctuate between companies based on time of year and also how much the competition is charging. The best place to buy tickets is either at the tourist information centre in Old Town, through your accommodation if you are staying in a hotel, or direct from the companies down on the docks (short walk towards the shopping mall from the UFO bridge). This is the cheapest and easiest option, but the route is not the prettiest. We paid €13 each for a return in which the outbound journey was pre-booked and the return was open (which is really handy). The journey took about 60 mins and the time table offered around about 1 bus every hour too which was great for flexibility. 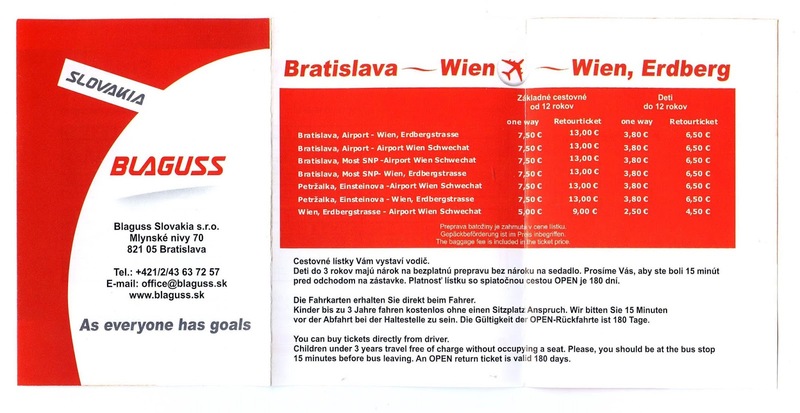 The bus will drop you off at Erdberg in Vienna, take underground line U3 a few stops into the city. During the day you can buy tickets from both bus stations on the day or beforehand if you prefer. Originally our first choice of transport due to the idyllic idea of sailing down the Danube from city to city. However the Ferry/ Hydrofoil services are seasonal from April to October. With “Lod” the price is €29 each for a pre booked return and for some reason costs €38 the other way. 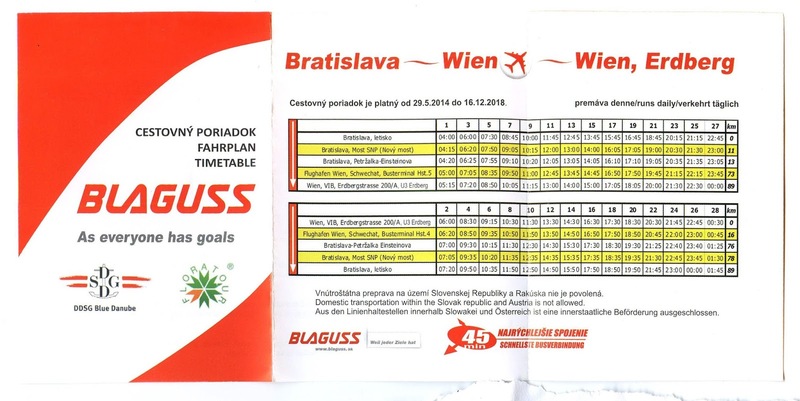 The journey also takes 105 mins to Vienna and 95 mins back to Bratislava. “Twin city liner” is also another company offering this trip at a cost of between €20-€35 depending on the time of year for a one way ticket! The journey time is also around the 90 mins mark. Before realising that we might be able to take the ferry the train was our initial choice of transport but one problem is that the train station in both cities is a little out of the way. Not a massive deal but it certainly isn’t as central as either the bus station or ferry terminal in Bratislava. The train should take just under and hour and although information has been hard to come by the general cost seems to be around about the €20 mark for a return. Once in Vienna you will be at “Hauptbahnhof” so take underground line U1 to the city. We actually headed down to the docks to get our tickets (just a short walk from the UFO) to be informed that the boats were not running. However whilst at the harbour we were directed to a store just across the road in which to buy tickets. We ended up getting the Blaguss/ Euroline coach as well as picking up a 25% discount off admission to the UFO bridge observation deck. The price of the bus really fitted our budget, we booked the bus the day before we went in order to get a good time but it’s not always necessary. 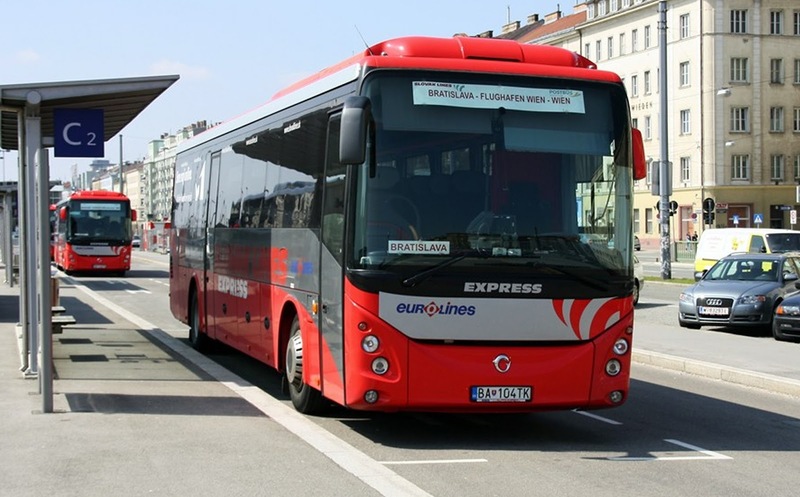 We booked our coach for 7.50am as we wanted to get as much time in Vienna as possible, having the return open was a real bonus as we could decided just when we were ready to come back and not be rushing. The bus arrived at stop 2 on time and unlike the major messing about with passports and checking visas when heading to the Ukraine we were on in a flash. The coach itself was actually pretty good, it was comfortable and even had toilets. We settled in at the back and had plenty of room to spread out. After only 20 mins we flew past the border crossing. There was no need to even bring our passports with us on this trip, although we were advised to bring our drivers licences as ID but never needed it. Made a change to the 3 hour interrogation at the Ukrainian border only a few months earlier! One of the things we noticed as soon as we crossed over in to Austria was the amount of wind turbines, they were everywhere, rows and rows of them as far as the eye could see. The roads felt that bit smoother and the infrastructure felt cleaner and more modern. The change was subtle at first but the mesmerising fields of wind farms became more and more! The journey went by quickly and before we knew it our feet touched down on Austrian soil for the first time, our 26th country. You can just about make out Bratislava Castle, taken about 10 mins after we crossed the border. After what could only be described as an amazing day exploring Vienna we headed wearily back to the Ubahn and took the short ride back down the Orange line to Erdberg we jumped on the last bus back. The wind farms now became a sea of blinking red lights and before we knew it we could see the glowing castle of Bratislava before we crossed over the border back into Slovakia. Vienna… worth the effort just a little!! This is one of the best areas to take advantage of the close proximity of different major cities within Europe, other cities such as Budapest are also well within easy reach. Soon we will be taking the train from Dublin to Belfast, so look out for another guide! Anyone else taken this trip? We think it’s a real highlight of visiting either city. 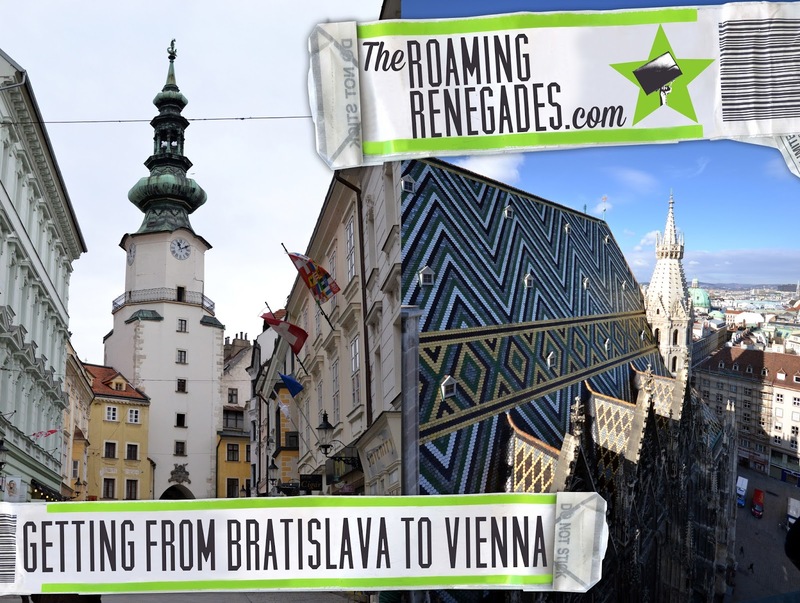 Bookmark this article Getting from BRATISLAVA (Slovakia) to VIENNA (Austria) and back! Guide and Report to historic DUBLIN, IRELAND! True, I think since we went they have started to do random checks, we noticed when we went through the Baltics that the borders were no longer being enforced but they made sure we had our passports before getting on the bus (which they didn’t on this trip and the ticket office told us we didn’t need them). But on one trip we were pulled over by the police just before the border and checked.